jdizzzle : browse the skin folder and delete the ".wav" files. I sometimes get the 'all programs' bug on my Danish windows. I can see it's fixed in this skin. 5 stars from me. great!! Congrat man! This is a realy nice skin! I know it is lame but i usualy use few of the wincustomize "classic" skins (realy good ones) and my own skins. I dont like skins that apear unbalanced. I like when someone does his homework. And you done it here man. Great concept and execution! I have apsolutely nothing to complain about and that happens rarely to me. This skin is one of those classics!! Very nice, but could be a little more transparant. start to be a bit unsable and usability is very important to me. When I originally installed this theme the "All Programs" entry on start menu did not work. I removed it from WB and re-installed it many times over and it would not work. I saved my desktop with theme manager then stored it away for future use and mailed danilloOc to see if he could shed some light on things. A curious thing occured yesterday, I re-applied the saved suite and it worked? Originally when I first applied the theme I had been having a good clean-up of my PC, re-installed Windows with all updates and the programs I use then made an image of my hard drive with Acronis True Image just before applying the themes, out of curiosity I re-installed my image with Acronis today, applied the themes and guess what? they did not work! I then saved the desktop with theme manager and immediatly re-applied the suite and it worked. So saving the desktop with theme manager and re-applying it works. This is my preferred skin for everyday use on my machine, simple, clean and functional. danilloOc, thanks for taking the time to mail me I appreciate it. Using Win XP English SP2 / WB 5.01, I had the same problem cited by Daillew. As 5imple is the best skin I've yet seen, I was determined to use it. I decided to un-install/re-install WB in order to re-load 5imple Alpha which didn't have the "All Programs" issue. Unloaded WB, rebooted and presto..."All Programs" was now working! No need to go back to the Alpha build. Not sure if this will work for other languages, but it's worth a try. Congrats to danillo0c for a superb skin. I have been using this skin almost exclusively for over a year now. It is clean, sophisticated, and one of the best skins period. 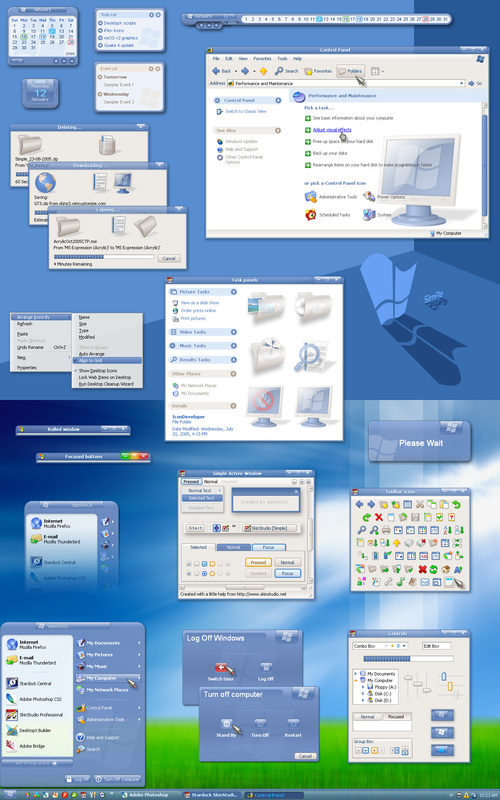 Any chance of updating this for Vista?? Please? Pretty please?